Mesh Victims are Pissed Off! We ALL Should Be! This is understandably offensive to victims who do not want to see their bodies as series of business transactions; and, I can’t say that I blame them, but this page does not tell people what they want to hear but rather need to hear in order to make the best decisions based off of facts. 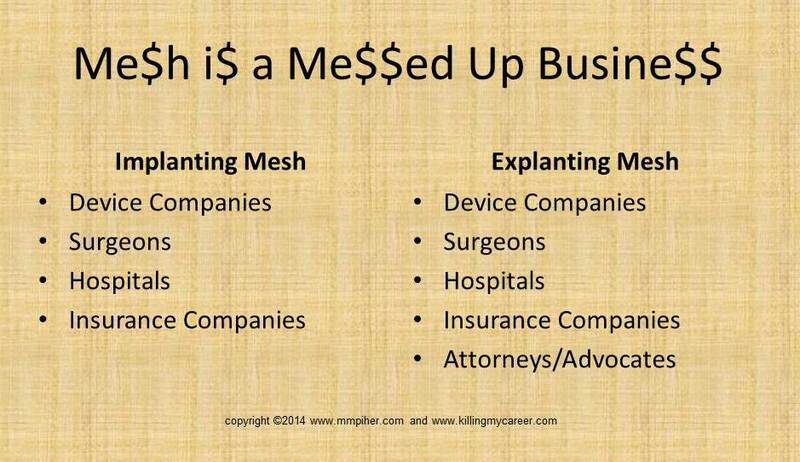 Implanting mesh into bodies creates profit for device companies, surgeons, hospitals and insurance companies. It’s not a pretty picture but it’s the reality of the situation. 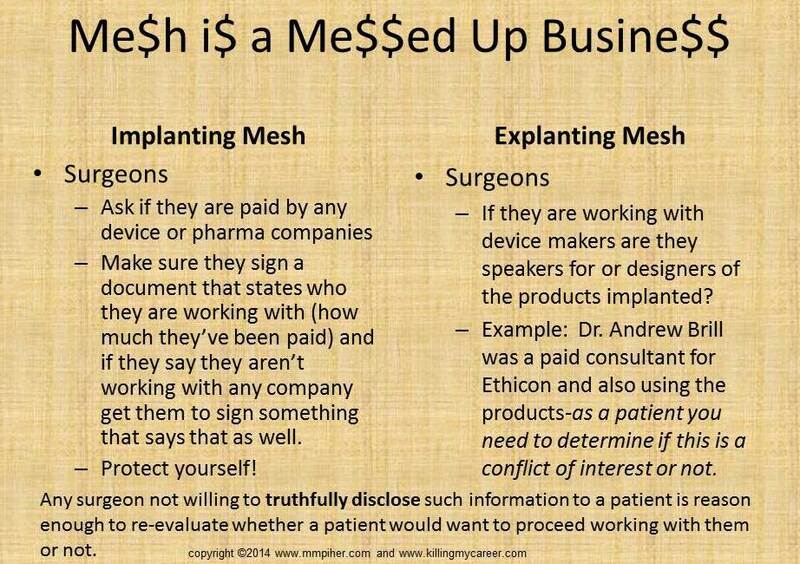 The inverse is also true when explanting mesh, device companies (sometimes the same companies that implanted mesh will make money again upon the removal with other devices), surgeons, hospitals, insurance companies and attorneys/advocates all stand to profit form this process. Go ahead, get angry-no get pissed off, then get realistic–get pissed off again and become your own advocate for your health. Once the facts are provided better choices can be made to force accountability from everyone in the broken system. How you do that is by educating yourself and asking questions (lots and lots of questions) and keep very detailed fact based relevant records. Do not allow yourself to become a victim a second or third time. This is prefaced with that there are good in bad in all elements associated with this process. Make sure you expose the bad and work with the good. 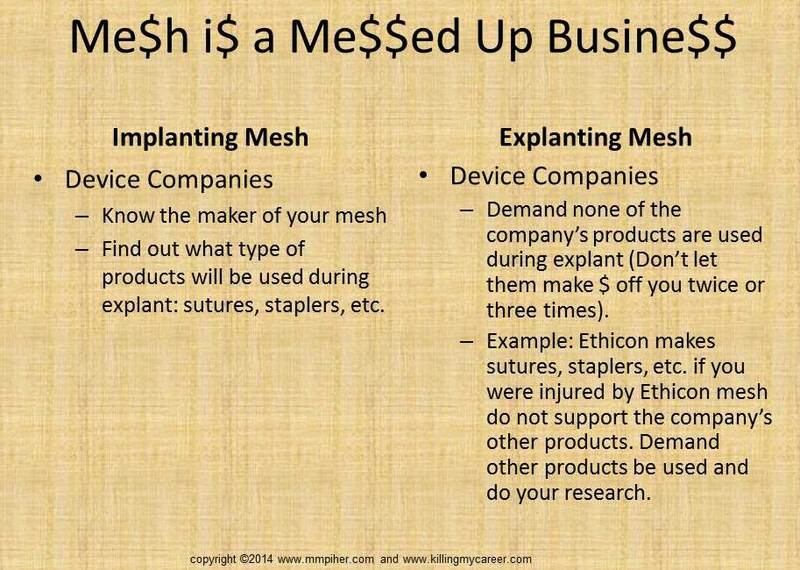 For example: Go to the Ethicon site not under the patient section but healthcare provider section and make sure none of these products will be used for upcoming procedures if you’ve been injured by Ethicon/Gynecare mesh. Every patient should do their homework and the new disclosure of payments from device and pharma to doctors through the Sunshine Act this makes that much easier; and, all the more reason physicians should have no problem disclosing such information to patients and signing a document prior to any surgery. Again, remember there are good and bad within every system and just because someone is paid is not necessarily a bad thing but extremes are usually a good indication of an area of concern. Context of payment is used by many in the industry as way of #PRSpinSunshineAct to try and justify exorbitant payments. Something many of these physicians should have thought about prior to the data release and not after #PRSpinUnSPunSunshineAct where patients need to decide whether context really means conflict of interest? Many hospitals looking to save costs on their end #PRSPinReProcessing will say that reprocessing an item will pass the cost savings on the patient. 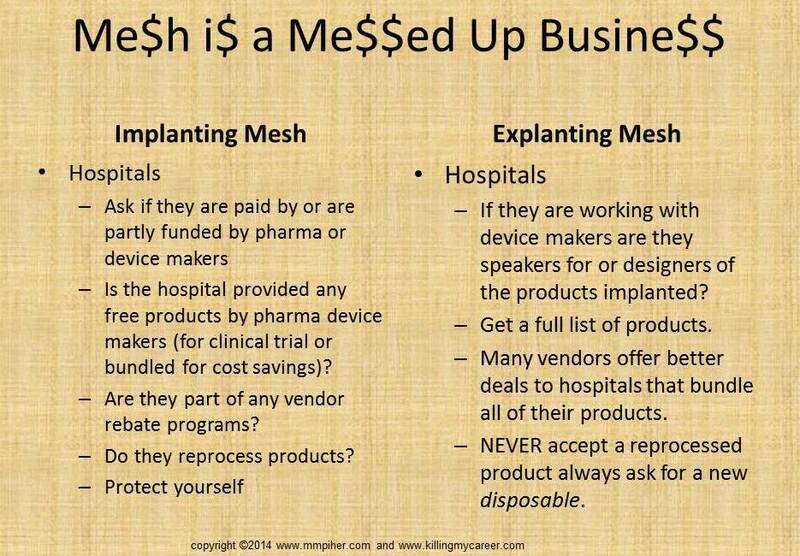 Yes, desposible devices (used once in a procedure and tossed) are expensive and part of the problem but are designed to be just that, disposable and for good reason. However, #PRSpinUnSpunReProcessing hospitals looking to save a quick buck at the patient’s expense isn’t the answer either. The best example I can give is a personal one when I was selling plates and screws and a hospital decided to reprocess disposable the drill bits in a consigned tray. A consigned tray is a tray taken to every account in the reps territory and used by the entire patient population (in my case including the County hospital which saw its fair share of Country prisoners). A drill bit used in the mandible (lower jaw) is not unlike a regular drill bit used in wood. Little particles stick to it and no matter how well you clean it once it’s been inside the head of a patient with a blood disease (HIV, Hep) I would never want to use that same drill bit in another patient, would you for a $12o product? Again, education and make the best decisions based on facts. High priced devices are still a huge part of the problem and will still be addressed on a different post with detailed breakdowns. Here’s an example of how the hospital gets paid. 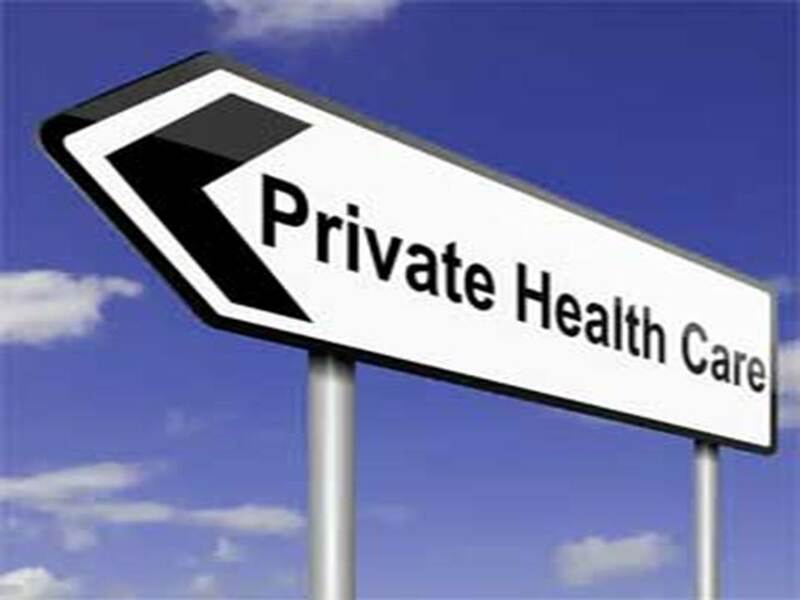 We see that the device/pharma industry are paying billions to the DOJ or recent settlements to victims but what we’re not seeing is private health insurance companies going after device/pharma and industry for re-payment and the question is why? The private insurance companies go after victim settlements but not the actual companies that caused injury. from the private healthcare insurance companies to go after the device companies and not the victims! I cannot state enough that there are good and bad within every faction of business and this area is no different. #PRSpinAdvocates work for free, #PRSPinUnSpunAdvocates they do not for free nor should they. An Advocate should be doing what you cannot (either due to physical limitation or knowledge in an area). Meaning an advocate should be helping with campaigns, media coverage, etc. and it’s naïve to not see this as a business. That said, I would not give a dime to anyone whom I didn’t have a contract with where specific terms were addressed along with expectations. 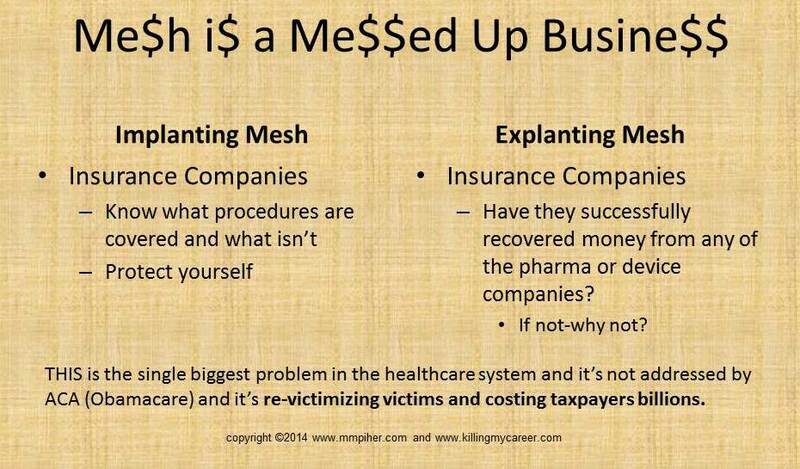 The mesh goals for all victims should be remove mesh from the market and help victims hold the device companies accountable by providing victims with fair settlements and holding the insurance companies accountable by going after the device companies (which still is not happening). Any social media support group or advocate that’s deviating from these goals I’d question why and work to expose the truth eliminate it from the process and work with like-minded individuals with the same goals. 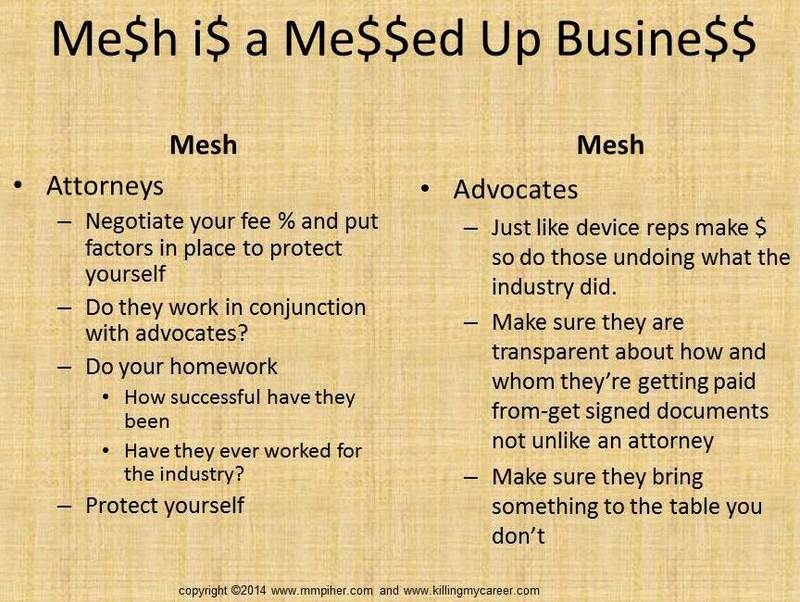 Medical sexism is alive and well in the mesh community; and, this is not victim blaming, but understand how the community is perceived from an industry insider to ensure you are receiving the best medical attention. For every 100 victims that are injured from a medical product there is one that will complain about problems that are not related to the specific product and that one, unfair or not, will set all the others back weakening the overall argument to remove the product from the market and trust the FDA and device companies count on this as reason to prevent pulling the product. When working with your providers make sure you are direct about the problem, be able to articulate accurately exactly what you are experiencing and keep focus on the problem as it relates to your mesh related injury. Example: If a patient is in with the medical provider discussing the migration of pelvic mesh do not also mention a new foot pain (as it’s likely not associated with mesh) this hurts that patient as well as all other women who want the product removed from the market. If you never had headaches before mesh implantation and now do mention that but if you’ve had headaches since your teen years it’s not relevant to your mesh case. * One of the number one complaints from medical providers is that patients will come in with one problem but try and squeeze 15 into one appointment. If you’re there for one problem stay on that one problem if you want to be taken seriously. (I know this seems harsh-it’s the reality-Remember I’ve been in OR’s and doctor’s offices for over 15 years and working as a consultant privy to which patients are perceived as creditable and which aren’t). *The information provided in is not legal or medical advice just an overview of how and why the industry often dismisses victims which prevent the removal of certain products. If you are already working with specific providers or attorneys consult with them and ask directly how they want the information conveyed to strengthen your case. WOW,SO HAPPY TO SEE THIS.WE ALL WANNA TELL OUR STORIES AND BE HEARD,WE DESERVE THAT AT LEAST. You all deserve more than just to have your stories told Lisa, you all deserve to be made whole! 100% agree with Melayna. You all deserve to be made whole.